A year of winning ended with losing. But the Sharks fought valiantly on Sunday. “Winnings is better than losing, but sometimes it’s not meant to be,” Coach Edgren said. Behind starter Shervin Shakki, the Sharks mistook Los Nicas red shirts for blood and got going right off the bat. With Santo Anibal Blanco on the mound, José Muñoz got going in the top of the 1st. With Muñoz at third base and Niclas Ekström at first, a missed pickoff attempt to first ended up scoring both runners to take an early 2-0 lead. Göteborg Hajarna added to their lead in the third, going up 3-0 on a Los Nicas squad that looked stunned. From the normally very jubilant crowd, mutters could be heard. 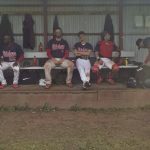 However, they didn’t have to stay patient very long as the Nicas got to Shakki and scored two runs in the bottom half of that third inning and made the game a close affair. It was going to stay close. After a scoreless 4th frame, Los Nicas once again made their bats do the talking as Shakki loaded the bases with one out. Coach Jonny Edgren took the ball from Shakki and handed it over to former starter Mokhlad al-Ghanimi. Straight from the bullpen, al-Ghanimi looked solid but Los Nicas made him pay anyway. Fine hitting from the Nicaraguans drove two runners in before the former Iraqi international could get out of it. Down by one run, the Sharks once again made their bats ring and evened the score in the top of the 6th. al-Ghanimi was good at tossing the ball. Unfortunately (for the Sharks), Los Nicas scored two more runs in the bottom of the 7th to make it 6-4. The score stayed that way until the top of the 9th inning. Coach Edgren, who humbly had inserted himself at first base, got hit by a pitch to lead off the inning. José Martinez then flew out to deep left field for the first out and Eric Marquez drove a single to center field to put the winning run at first base. al-Ghanimi then unloaded for a hard single to score Edgren from third and advance Marquez to third. Not before long, al-Ghanimi then stole second to put the leading run at second base. With the home crowd behind them, Los Nicas turned to their closer, Alejandro Davila, against Lars Karlsson. Karlsson fought valiantly at the plate and eventually earned a walk to load the bases. The tying run was 90 feet away. Coach Edgren, for some reason, brought this reporter in to pinch run for Karlsson. Daniel, ‘Big D’ André stepped up to the plate to pinch hit. Alas, this was not el dia para Los Tiburones and André grounded to first base for the 3-2-3 double play to end the game with a final score of 6-5 in favor of the Nicaraguans. “We kept it close. We almost had this one and when we play as a team, like we did today, we are so very strong,” Coach Edgren said. The joy among the Los Nicas players and fans could not be mistaken. Chants about Elitserien play was ringning out all across Alby and it will surely be interesting to see what they can do in the top division come 2018. But they had to work for it as the Sharks put up a great display of baseball. “This Sharks team, they never cease to amaze me,” a tearful Edgren added before leaving for greener pastures (the drive home to Gothenburg). Göteborg Hajarna this weekend played what was probably the best two games that the Sharks faithful has seen in the last two or three years. The rebuilding strategy from the front office is a success so far. If the team can add a couple of players and keep developing the guys in the current squad – Elitserien is not far away. It might not look that way, but this bunch was kinda happy. “That [Elitserien] is our goal of course. That is where we want to be,” veteran backstop Toofan Khazal added. Surely, this heartbreaker of a loss feels bad right now for the Sharks team but they will hopefully feel proud about what they’ve accomplished during the season. “It was a hell of a run and we played our best baseball when it counted the most. 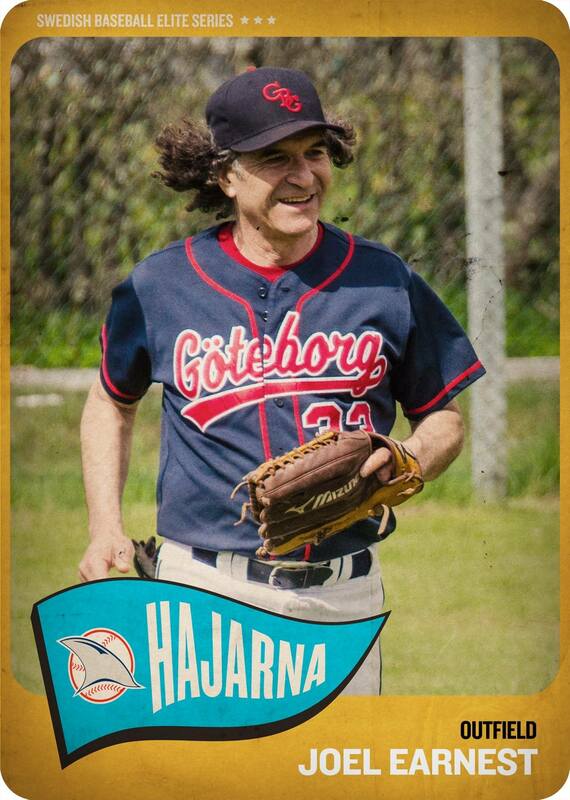 That feels pretty darn good,” free agent second baseman (and future Malmö Pilot?) Marquez added. The Sharks will possibly close out the season with some SWBL action at Shark Park. If not, this here ‘news’ site will next be seen with a season review of the squad. Muñoz played defense so great it drew cheers from the Nicas fans. Niclas Ekström was not hit by a pitch but played great defense at first base. Joel Earnest, 69, drove a single to right field on the first pitch he saw. The combined blood pressure of the Sharks team during that final at bat was not healthy. Martin Sundh and Roger Karlsson umpired a very good game. Hannes Wiström is turning in to a solid third baseman. This entry was posted in Gothenburg Sharks on September 17, 2017 by alex. These Sharks never give up. These Sharks know that winning is better than losing. These Sharks got the better of Alby. ”It went down as I expected,” Coach Jonny Edgren says. After two quick outs, the Alby Stars got on the board in the first inning against Sharks ace José Martinez. Behind an error and a wild pitch, the Stars got to an early 2-0 lead. Offensive juggernaut José Muñoz took one right back in the bottom half of the first one. Reaching on an error and then stealing both second and third before scoring on an error as Daniel André drove him in. The game then stalled (well, the second inning was scoreless) a little bit but the Stars took one run in the third before the Sharks got two back to tie the game in the bottom half of that third inning. The Stars then got two more runs in the top of the 4th before the Sharks took their first lead of the day in the bottom half, scoring three runs to make it 6-5. Sharks starter Martinez was battling the solid Stars lineup and more often than not pounded the strike zone. The Sharks put on a quality defensive display, probably the best they’ve played all season, and kept the game in control. Especially impressive was Muñoz at shortstop who showed off his range and cannon to throw runners out on a regular basis. With the score at 9-8 in favor of the Stars, the Sharks got going again in the bottom of the 7th. 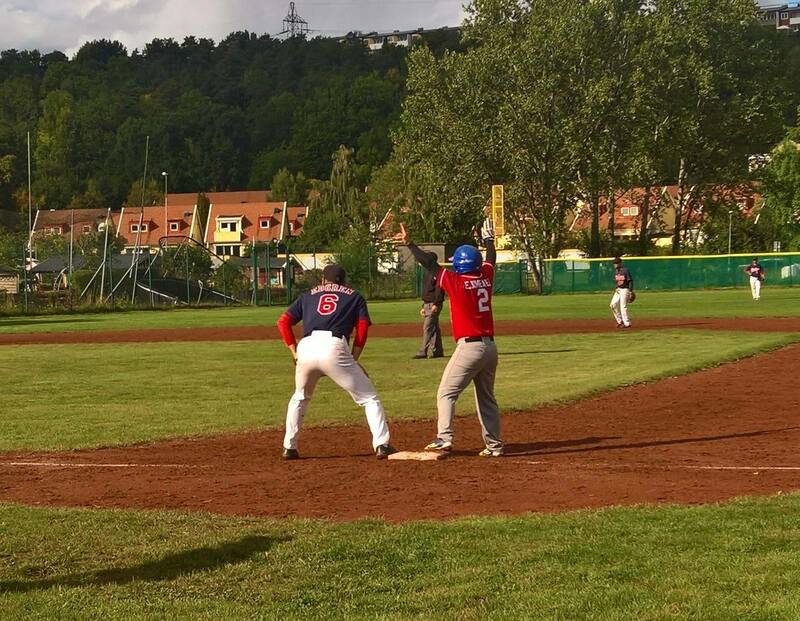 Solid hits all trough the Sharks lineup as Göteborg sent ten men to the plate and the Stars could not get out of it. The Sharks got eight runs in that marvellous 7th inning and never looked back. Martinez was solid at the plate as well. “I know that we have a good team, when we play like a team, we can beat pretty much any team. Today, we did just that,” Edgren says. Martinez closed out the game, allowing one run to score in the 9th to make the final score 16-10. “He pitched a hell of a game. A little shaky at first but once he got going he was pretty much on spot on all through the game,” veteran backstop Toofan Khazal said at the post game press conference. The Sharks will play on Sunday against Los Nicas who routed Tranås earlier on Saturday, making in 16-1 in six innings. It will be a whole other matchup as the Nicaraguans are pretty much the most complete team in all of the regional series. 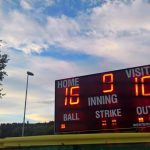 They had a real scoreboard at Seagull Park. “It’s gonna be tough. But when faced with challenges before, this team has risen above expectations,” Coach Edgren added. Fist pitch is at 12.00 @ Seagull Park in Alby. Niclas Ekström came in to pinch hit and went 2-2 with a double. Eric Marquez made a play at second base worthy of the MLB web gems. Ted Bratsberg was not at the game. Possibly because there was no fence to put up. Skipper Jonny Edgren got a hit. The sun was shining all day long. This entry was posted in Gothenburg Sharks on September 16, 2017 by alex. One of the more high profile-players is seeing the end of the road. Joel Earnest is going to wind down. After spending approximately 40 years in the Swedish minor leagues, Joel Earnest, 69, finally got the call. He was going to the big club. Six seasons later, he’s a regular figure in Coach Jonny Edgren’s lineup and the Hajarna faithful know him as “Mr RBI”. 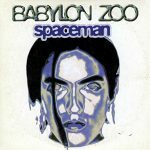 In the clubhouse, Earnest is more known as “Spaceman”. His stories on the way it was are legendary and he is the glue that has kept this team together through these last couple of seasons. A couple of seasons later and the rebuilding process is coming full circle. The organization is stronger, the youth movement is real and the results keep coming. Even practice is more well-attended. Earnest always enjoys winning better than losing. Earnest has had his moments on the field too. Just look at this past season, hitting .571 in the second half and helping the Sharks clinch a playoff spot early. During the years on the big club, he’s been known for his high contact rate and the Ty Cobb-like ability to aim the ball where the defense is weak. “I’m happy with my career. I only wish I got the call some fifty years earlier. I expect my numbers might be a little higher in some areas,” Earnest says. 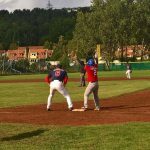 Earnest also played in the Elitserien back in 2015 where he memorably took the mound in the late innings against Sundbyberg and got relieved by his son, Erik, who took over. “Yeah, when I came in to protect Jason’s no-hitter, and then Erik came in to bail me out after I filled the bases, but still without giving up a hit. Erik struck out the next batter, and then I started a double play from left to get out of the inning. It was golden…” Earnest says. And now, after the playoff weekend, Joel Earnest will look to cut back on his playing time. 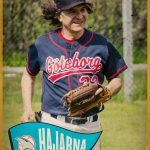 He has vouched to still be the team uncle, still be the informal leader at practice and provide his wisdom and skills at the majority of the SWBL games and the occasional regional game — especially against the Malmö Pilots. “It’s time to free up som playing time for the kids. Not too much though, but some. And I always enjoyed playing the Pilots, even during the years when they dominated us,” Earnest says. 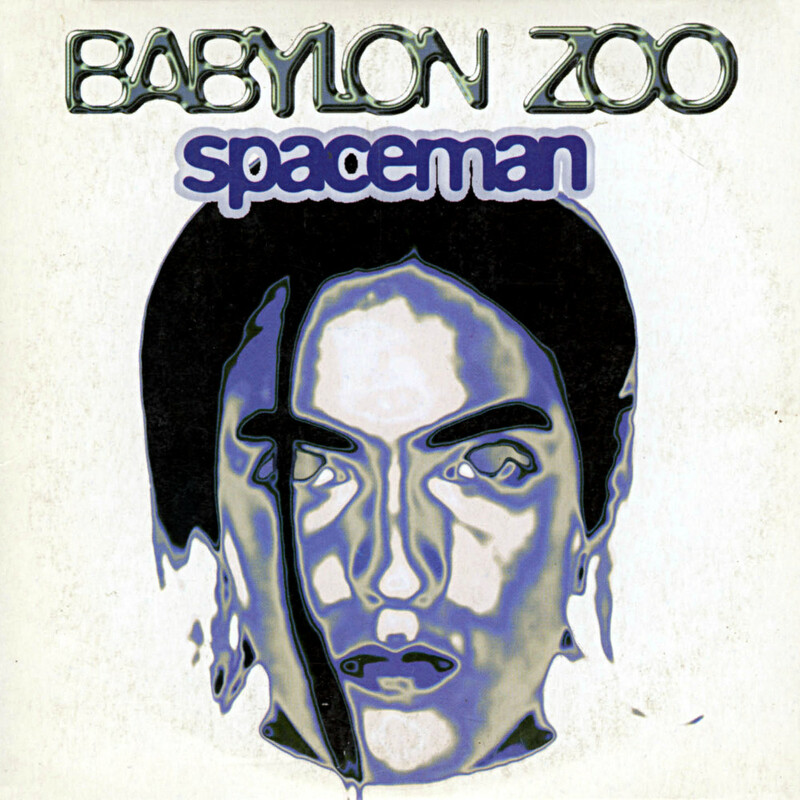 Babylon Zoo famously wrote a song about Earnest. The Hajarna faithful will take some time to get used to not having Earnest out there every day. But when it’s time, it’s time. This entry was posted in Gothenburg Sharks on September 15, 2017 by alex. As my soul prospers from seeing the sun set in the mountainous horizon of the view looking north west from Shark Park, I recall the past year at hand. Then, in the year 2016, closing in on the play-offs of the Major League of the honourable contest of bats, balls, and gloves, realizing that it could give me the opportunity to live what many men in history never had the chance to experience, the World Series victory of the team from the north side of Chicago. It was a tough night to sit through on the European continent on November 2nd, 2016, but the lack of sleep could not bother me. 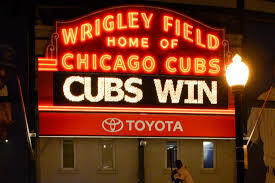 Since the age of six, I was chosen to be a follower of the Chicago Cubs, and now the time had come. The rest, as they say, is history. As it turned out, history had just commenced. Little did I recall, that I had made a promise in the year 1999, then retiring from baseball after being a part of national champion team of the Marsa Mustangs of Malta. I claimed this was my peak, and I thoroughly was convinced that I did not want to retire on a bad note like Alexander Karelin or, like earlier this present year, Usain Bolt. I wanted to retire a winner. My conviction had me state a promise that I would make my comeback when the impossible occurred, the Cubs winning the World Series. On New Year’s Day present year, I sent a message to the local organization executing this type of athletisism, and the following day I received a reply. A former elite club, in one of the largest cities in the nation. Entering spring training two weeks later, I encountered a group of fine gentlemen of various backgrounds, with the ambition to enjoy the comradeship and improve their execution of handling bats, balls, gloves and bases. 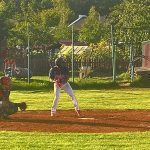 Now, the autumn raindrops shatter when landing hard on the home plate that is surrounded by a muddy field in the outskirts of Gothenburg and the season is coming to a conclusion. 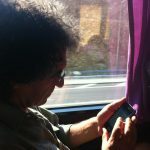 Some eighteen months ago, I booked a trip to Piemonte, Italy on the very weekend of the playoffs this year. My playtime had come to an unfortunate end earlier than expected, but this fine group of individuals of various ages and backgrounds, will execute in a proper matter. Nolan Ryan retired at the age of 46, Bill ”Spaceman” Lee pitched a professional game this past year at the respectable age of 65, so how long can such a career flourish? Although, it is hard to determine the age of marine creatures, but from my experience of this past annual term, we know that a carcharadon can still come up with a miraculous double and an occasional stolen base to win a duel on the diamond at ages where both Spaceman and a retiring Ryan would be considered youngsters. This entry was posted in Gothenburg Sharks on September 13, 2017 by Joel Earnest. In this first playoff preview (total number of previews not yet known) we take a the look at the Sharks’ first opponent and possible matchups on Sunday. 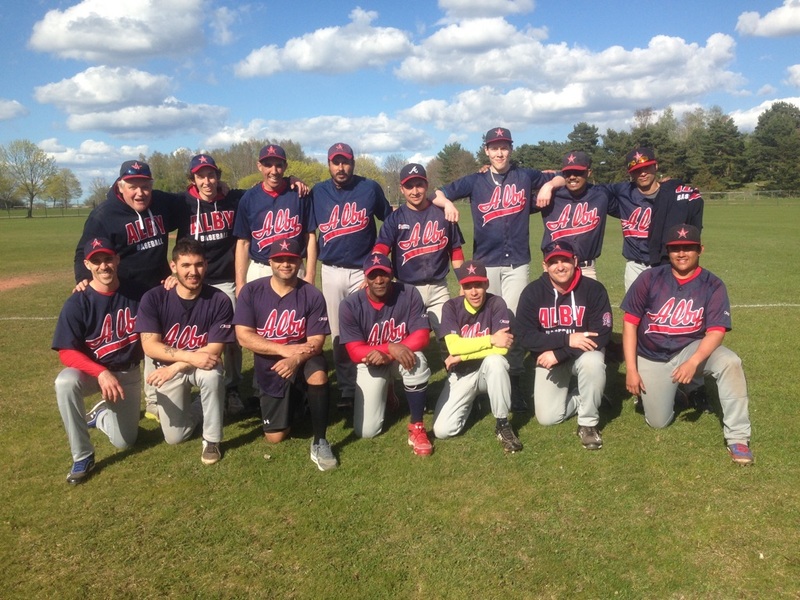 The Alby Stars (9-5) will be the away team at their home field, Seagull Park, against the Göteborg Hajarna (9-5) on Saturday in the semifinals of the regional series playoffs. 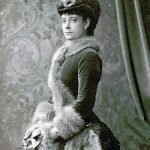 As the observant reader might have noticed, these teams have the same record and could only be separated in the standings with the help of Lady Lotten and the luck of the draw. While they have the same records, they are not the same team. 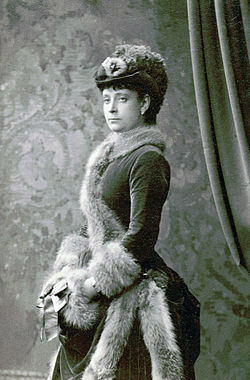 Lady Lotten Dorsch would probably have agreed that winning is better than losing. 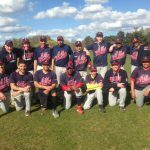 Alby was even more impressive last season as they went 14-2 during their 2016 campaign. In the semifinals, they were up 5-0 when they had a meltdown in the bottom of the eight inning and gave up nine runs to lose the game 9-5. The Sharks scouting department has naturally had their eyes on the Stars for a while now and is obviously aware that the Stars have not regressed. “They got pretty much the same guys out there. They are a year older, but lost their coach from last season. Still a lot of experience and a lot of solid bats in their lineup,” according to an anonymous scout. 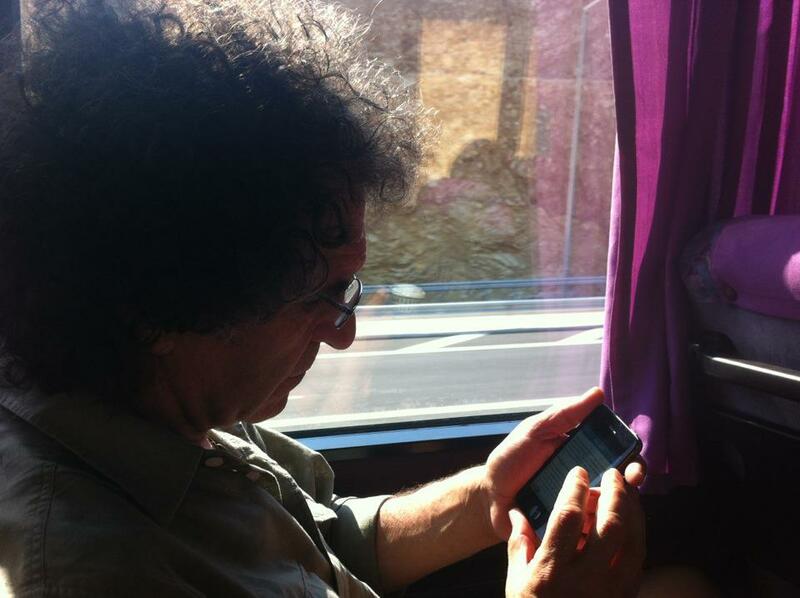 In this picture, Alby was a couple of years younger. Those solid bats start with Roberto Hanoi Labrador Montero (as far as I know, the longest name in Swedish baseball) who is a force at the plate. The first baseman/center fielder sports an impressive slash line of .500/.608/.603/.1212 in 58 at bats. Not far behind is the Stars catcher, Osbel Arias Torres, batting a solid .448/.551./542/.1094. Torres’ defense also deserves respect as he has only five errors on the season and throws out runners at almost the same pace as the Sharks’ backstop Toofan Khazal. Overall, they have a solid lineup with some pop. If we compare the two teams’ statistics, it is a pretty tight affair. Sort of tight, but with the Stars atop. The Sharks do come out ahead in a couple of categories. 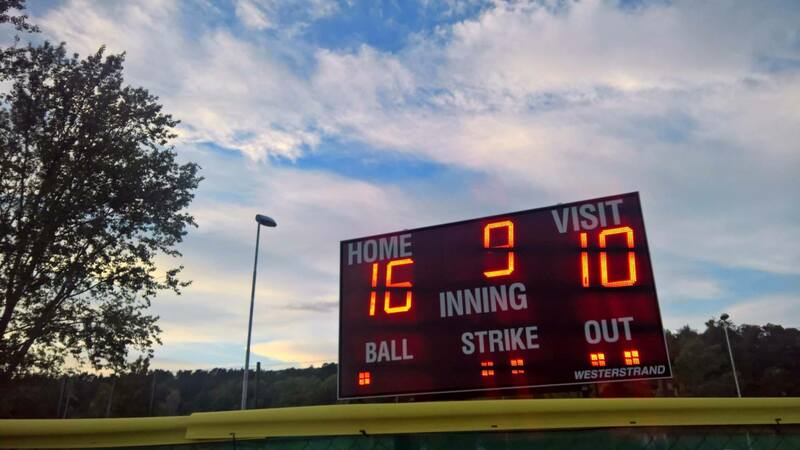 And that is all well and good, but as the saying goes,”pitching and defense win championships.” While obviously not quite true (you actually have to outscore your opponent in baseball), it does help. A lot. The two pitchers in the Stars organization who have logged the most innings this season have not fared all that great. Aridany Moreno Fajardo is 4-2 with a 6.21 ERA and Ramon Illa is 3-2 with a 6.63 ERA. While that is not impressive on the surface, one has to consider that the Stars faced off with Los Nicas four times during the season. Overall, it’s close once more if we start looking at the categories from a team perspective. The Stars put up a solid defense behind their pitchers (at least, I think). As fielding defense in general are stupid and errors in this league (and all leagues) are based on one person’s subjective view, these following numbers should be taken with a grain of salt. That is one atrocious fielding average posted by the Sharks and can and should not be white washed. On the other hand, this reporter regularly patrols the outfield so it might not be that much of a surprise. Conclusion: These are two pretty well-matched teams that will probably play a good game. My guess is that one of the teams will win and that the winning team will score more runs that the losing team. Los Nicas (11-3) was the top team in the regional series (not counting the “regional” team that Sölvesborg scribbled down on their lineup cards). While I would like to do an equally thorough review of this team, I’m now tired and won’t. The Nicaraguans rely on being really good at playing baseball. In regional series measures, they are exceptional at throwing the ball, led by Omar Marin. 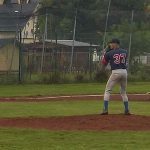 He is the top pitcher in the regional league (including the “regional” team from Sölvesborg) and owns a brilliant 0.74 ERA. They have a great 1-2 punch with Santo Anibal Blanco who himself has an ERA of 3.67 (better than any Sharks pitcher). As a team, they lead the league in ERA and are second in batting average against. Los Nicas are good at baseball. On offense, they are lead by Alexis Mejia who boasts a .467/.625/.527/.1152 slashline. As a team, they are solid in pretty much every offensive category and are atop in stolen bases with 105 (Alby is second at 93. Tranås (8-6) went 3-1 against the Sharks during the regular season and made it to the second round of the playoffs this past weekend. Uppsala decided to not show up to play and Tranås got the better off Gefle as they took that one easy, 21-6. Other than that, the Sharks faithful are well aware that one can never relax while playing Tranås. 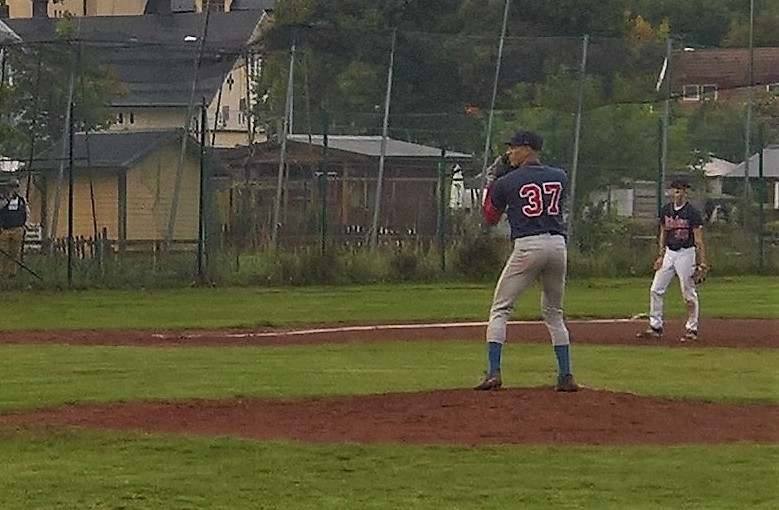 First pitch is at four, Saturday afternoon, September 16 at Albyfältet. (Joel Earnest contributed to this report). This entry was posted in Gothenburg Sharks on September 12, 2017 by alex. It was muddy out at Shark Park today. The muddiest in years according to veteran Sharks. But even with the late cancellation by Skövde, everyone still had a great time. Fourteen players showed up Sunday morning, ready to play and that’s just what they did despite the mud and cancellation. 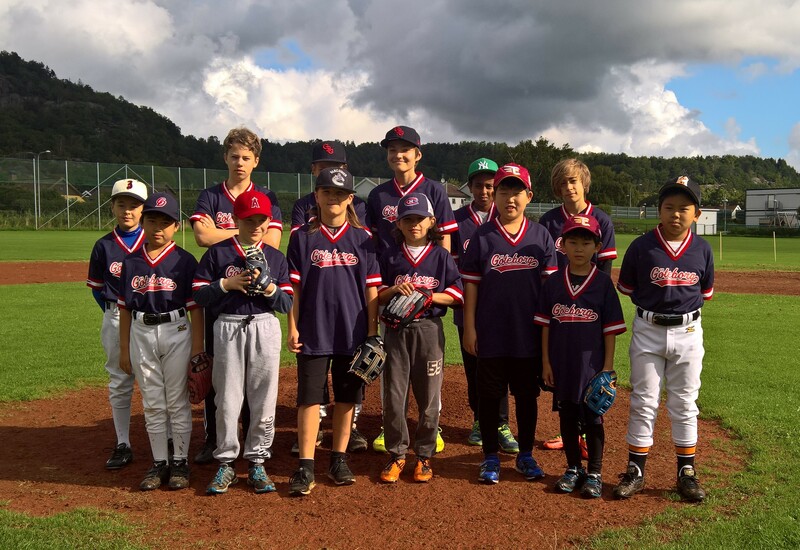 Even without Skövde, there were still enough players to form two teams and play a doubleheader with the assistance of a few dads in the outfield. And you could see the results of all those Tuesday evening practices, with plenty of nice plays by the young Sharks. Between hot dogs during the break, the most common question was “When can we do this again?” Coach Edgren hopes to be able to reschedule the Skövde-Gothenburg matchup before the season comes to a close, but it will have to be after the junior league playoffs on September 24. This entry was posted in Gothenburg Sharks on September 10, 2017 by Joel Earnest. 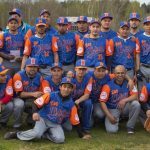 Skövde swept Gothenburg when these two teams last met, topped off by a dramatic come-from-behind Saints victory in the final frame of game 2. The tables were turned this time around with a Sharks squad supplemented with three Kungsbacka Chief veterans taking both games against the Saints Sunday at Shark Park by scores of 8-2 and 12-5. This entry was posted in Gothenburg Sharks on September 4, 2017 by Joel Earnest. Branden Rooper-Hubbert started the second game of opening day 2013 with a home run! The ball was hit so hard it would have needed a flight attendant.